One of main problem in HTTP protocol is encrypting traffic and verifying data security, securing the web application against any threat is very important especially that if hackers conduct a Man-in the middle attack he can get all users information while data are transferred in a clear text form. HTTPS is a combination of the HTTP with SSL/TLS protocol to provide encrypted communication and secure identification of a network web server. HTTPS connections are often used for payment transactions, social network websites and for sensitive transactions in corporate information systems. 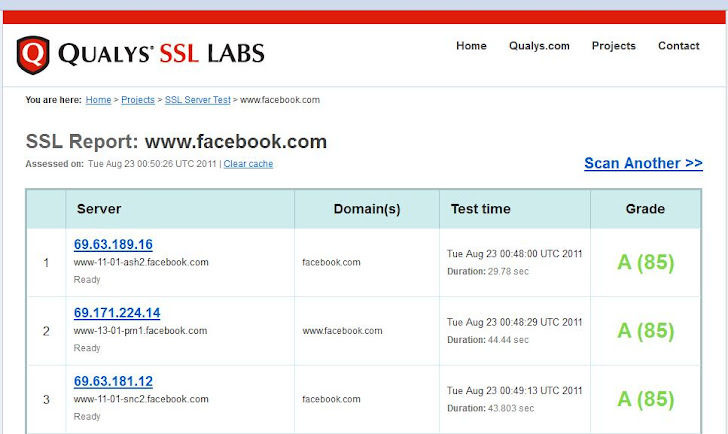 SSL Server Test is a free online service that performs a deep analysis of the configuration of any SSL web server on the public Internet. So you can check any website SSL security before using it to be sure that your privacy is protected.For testing you need just to submit the domain and service will display all servers related to this domain with a complete report on overall SSL Security.This is the result for Facebook while you can test your server to find out if there is a security problem with your HTTPS security service.